We had reported earlier that the next generation iPad 2 will be here in Q4. Today more sites began reporting on this speculation which might be confirmed sooner than you think. 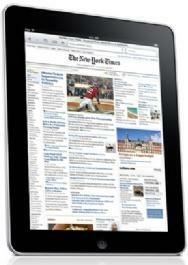 The new iPad 2 is being rumored to be set to release this Christmas. Not just that it is also said to be cheaper than the original iPad! It is also confirmed that the new iPad will be smaller with a 7 inch screen. A Taiwanese paper called Economic Daily News reported the news and claimed that it had ties with the company that was actually manufacturing it. This paper was the first to also report on the iPad before its release. According to the newspaper, the iPad 2 is being assembled by Taiwanese companies and has a 7 inch screen size. The report also says that the iPad 2 would be cheaper than the current model. The iPad 2 is also said to have one camera on top of the screen and will a brand new route call feature where you can answer your calls through the iPad without having to pick up your iPhone. So if you were reading a book, your iPad will notify you of an incoming call and you can continue to answer it on the iPad instead of reaching to your phone. This is an awesome feature especially for book lovers and movie watchers. With the 7-inch screen looks like Apple intends to compete directly with Amazon Kindle and the E-book market. You can read our previous report here.